To view additional loan and school details or to lend without leaving the student roster, click the button beneath any student portrait. To filter students by gender, field of study, repayment status, and other critieria, click the blue [Filter Roster] button atop the page. You are viewing all students. Click the search button at right to filter profiles. Set criteria above and click [Go] to filter the student list. Blessing’s source of inspiration to become a nurse comes from witnessing the reality of people’s health conditions at her previous job and an innate passion to help people through nursing and caring. School kept NP away from drugs, but he lost many friends to drug abuse. After college, he plans to open a learning center in his hometown to keep at-risk youth away from drugs by giving them learning opportunities. Struggling to support her ill father, it was not easy for Noe Noe to survive on meager earnings. As a migrant in Thailand, she has a strong desire to help improve the lives of other migrants after earning her degree. For three years finances kept Naung from starting college. With support from Zomia, she has now finished her bachelor's program and hopes to become a teacher in rural Karen State. Udom received a full tuition scholarship to study architecture at the Royal University of Fine Arts in Phnom Penh. He wants to build a resort in his hometown and improve Cambodia's cities through urban architecture. The eldest son in his family, Saw Moe has often had to choose between family and his own personal development. After six years supporting his younger siblings, he decided to follow his dreams and earn a university degree. Thel Thel hopes to obtain a quality education so she can improve the lives of migrant people in Thailand. Having overcome language challenges, she is currently pursuing a degree in social science. Some told Mway she should quit school and work to support her family. She is now close to graduating with a bachelor's in nursing, and well on her way to fulfilling her dream of becoming a gynecology nurse. The daughter of a former politician, May hopes to use her degree from the Education University of Hong Kong to help contribute to Myanmar’s efforts to unify its ethnic minorities. Arriving in Thailand opened Jasmine's eyes to the possibilities education provided. A bent for nursing, she hopes to become a nurse and nurse administrator after graduation. A former student activist, Wong Aung is today an established social justice and environmental advocate living in Thailand. A master’s degree in social science will help him advance his life’s work in the field of natural resource governance. A Shan native studying in Thailand, Sai Khung is the vice president of his school's student body. He aspires to become the Minister of Education of Shan State and an education reformer in Myanmar. Raised in refugee camps, Say K'Bleet will be the first person in her family to graduate from college. She wants to assist refugees living along the Thai-Burma border after graduation. Having taught students with behavioral problems, Waew recently discovered her calling to become a counseling psychologist. She hopes to provide professional help to those dealing with psychological challenges. An inspiration to her colleagues, Shengsar is pursuing a bachelor's degree in Social Science after two years in the field so she can work more effectively with migrants and refugees along the Thai-Burma border. Coming from a small town with limited access to computers, Thang Thang struggled during his first year studying in Thailand. He has since adapted and hopes to one day return to Chin State, Myanmar, to educate his community about their rights. Maybel left Myanmar in 2000 to access better education in a refugee camp along the Thai-Burma border. She’s since dreamed of going to college and believes she finally has her chance. After graduating from high school in 2005, Ja Ja worked various jobs hoping to save enough to attend college. Nearly a decade later, with a Zomia loan, she now has the opportunity to go to school. With a master's in educational administration, Juno is committed to a career in education. She wants to either teach migrant youth from Myanmar living in Thailand, or open a school in Myanmar. Raised by a Naga freedom fighter with no regular income, Wongap has overcome myriad obstacles. He believes a degree will improve his employment prospects and hopes to bring better opportunities to his people. Despite having to take care of younger siblings, Htoi Lar never ceased to strive for a better life. Through his involvement in community work and camps for internally displaced people in Kachin State, he hopes to become a community leader. Having lost her father as a child and her mother in 2014, Maew borrowed from Zomia to decrease the financial burden borne by her older sister. She hopes to become a teacher and help support her sister's family. Maintaining a nearly flawless GPA, Peter has a passion for business. He wants to work with a Thai company after graduation to gain experience before starting his own business in Myanmar. Having worked with international social enterprises before, Seik Mon wants to use his degree in business to found a social enterprise that helps improve society. Flaurince is a driven student from the Kayaw tribe, a small ethnic group of Myanmar. She wants to become a successful businesswoman and help raise awareness about the Kayaw people. Due to her father’s involvement in political activities in Myanmar, Ei Poke and her family ended up in a refugee camp in Thailand. Passionate about helping others, she is committed to serving her community as a social worker. Originally from Nyaungshwe, a beautiful town in Southern Myanmar, Mainn set her heart on becoming a tour operations manager and hopes to promote tourism in her hometown after graduation. The son of a high school teacher and education worker, Jonathan aspires to become an education administrator in Myanmar who works to increase students' access to education. During his time in Mae Sot, Thailand, Tun Tun gained medical knowledge and clinical experience as a field medic. Today he hopes to earn a university degree and become a professional nurse. Ei San was awakened to a whole new world when she left rural Myanmar for Thailand to pursue her education. After being exposed to newspapers for the first time, she decided to pursue a degree in journalism in Hong Kong. Born into a missionary family with limited resources, it was never easy for Mercy to pursue a quality education. Now studying interior architecture in Malaysia, she hopes to improve the quality of life for Myanmar citizens. An internship with the Sexual and Gender-Based Violence Committee motivated Sandar to become an advocate for women. After graduating, she hopes to improve the standard of living for women and children. Growing up in rural Cambodia, Van began striving to reach his goals at a young age. He is now pursuing a degree in engineering and technology in Thailand and hopes to become a successful businessman in the future. With a background in journalism and passion for the environment, Saiaew aims to use her degree in international development to create practical social and environmental justice solutions in Thailand. Vicky wants to be an agent of change and lead her community to greater achievements through business. Her idea is to found a center where local businessmen and women can come together to collaborate. Tin took a semester off of school to improve his health and help his family get back on their feet financially. Now a year later, he is determined to complete his degree and open a computer learning center in his hometown. Born into a farming family, Kyaw Zin empathizes with the plight of poor farmers in Myanmar. He is now studying economics in the United States, with a long-term goal of empowering impoverished communities in Myanmar. Unable to follow his mother and brother to Sweden as a refugee, We-Z is making a living for himself in Thailand. With a near-flawless GPA, he hopes to eventually work in government and become a professor. The need for skilled transportation engineers in Myanmar motivated Jasmine Kyaw to pursue a graduate degree in civil engineering. She hopes to work as a traffic engineering consultant and eventually start her own firm. Friendly and earnest, Leakhena took a loan from Zomia to help defray the costs of attending school for her family. She hopes someday to learn Japanese, work in Japan, and start businesses in Cambodia. Mee Mee knew she wanted to teach since she was a child. After years of working as a teacher and teacher trainer, she hopes this degree will bring her one step closer to becoming an expert in the field of education. The oldest of six and on the cusp of her 30s, Khine has never given up on her education. She hopes to become a government worker who uses her degree to bring the Myanmar government closer to its people. A clinician by profession, Zaw has also worked for years in management, strategic planning, and organizational development. He believes his degree will help him become an expert in healthcare management. The daughter of Karen freedom fighters, Spring grew up with refugees and migrants along the Thai-Burma border. After graduation, she hopes to work with the Myanmar migrant community in Thailand as an education administrator or teacher. Non Ah goes to great lengths to maintain balance between her work and studies. As a full-time student and employee, she does a multi-hour commute every week between Chiang Mai and Mae Sot, Thailand. Seng Hkawn completed a degree in computer science before finding her life passion teaching English. She plans to use her TESOL degree to prepare students for college at an English language training center in northern Myanmar. One of the hardest decisions Sabai made was leaving school in Myanmar to pursue an education in Thailand. She wants to become a professional community development worker and help anyone in need, regardless of gender, nationality, or status. Anui didn't wear shoes to school until 10th grade. Today he's at the frontier of preserving the history, culture, and language of the Lainong Naga people, an ethnic group with fewer than 10,000 members. Entering college in his 30s, Shine is studying IT in order to pursue a career in computer programming. In the future, he hopes to save enough so that he and his wife can open an orphanage together in Myanmar. Life as the daughter of a former freedom fighter is full of hardships and challenges. After being actively involved with migrant communities in Thailand for several years, Dar Linn is now pursing a degree in social science. Wah Wah has been a community health worker since 2003. She plans to use her master’s degree to help promote primary health care among ethnic minority groups in Myanmar. A social activist, Mu Sel speaks six languages and identifies with the Kayaw, a small ethnic group of Myanmar. She dreams of becoming a member of parliament and continuing to promote the Kayaw people. In middle school, Aye Phoo left her family in Myanmar behind to pursue an education in Thailand. Today she is a Child’s Dream scholarship recipient who hopes to work with Burmese migrant communities in Thailand. Undaunted as the only female IT student in her class, Ah Wang wants to return to Kachin State in northern Myanmar to help rebuild her war-torn community through technology and education. Educated at an orphanage school in Thailand, Ming has taken advantage of opportunities his sister never had. He hopes to use his international affairs degree to help the Myanmar ethnic groups overcome their differences. Separated from his family due to political and economic instability in Myanmar, Mi Ji has been living in Thailand for over a decade. Following his studies, he hopes to be reunited with his family and serve his community. A Myanmar citizen from the Naga ethnic group, hard sciences have always captured Poe's interest. She hopes to become a scientist or researcher in her community. Frustrated by informal profit-seeking pharmacies that exploit sick patients, A Tan envisions a Myanmar where every pharmacist is licensed and the pharmaceutical industry is properly regulated. Learning about environmental issues made Henry passionate about protecting the environment. After earning his degree, he plans to join an environmental organization to promote awareness in Myanmar. A strong English speaker, Finn wants to communicate with his lenders as family. Spending more time with his mom and raising his GPA to a 3.0 are among his goals this year. The only daughter of six, Amy grew up helping her parents earn income by selling sugar cane at school. She hopes to use her degree to contribute to Myanmar’s development as an entrepreneur or business owner. As the eldest daughter, Alinn had always felt a strong sense of responsibility toward her younger siblings. Still working in various jobs to help support her family, she is also striving to earn a university degree. Scarce financial resources hindered Goutham’s early education. In spite of this, he started his own company after completing the Pre-Collegiate Program in Yangon. He is now in Germany studying to become an economist. Financial constraints and family issues forced Sai Noom to leave school as a teenager. As an adult, he's making a comeback, pursuing a bachelor's degree in social science with the hope of becoming a social worker. Nora Htoo has maintained a lifelong dream of attending university and becoming a health educator. Against the advice of her family to quit school, she has persistently found ways to make her dream come true. An avid reader and traveler, HayMann works with marginalized communities from Myanmar. She believes a degree in social science will increase her capacity to better serve this population. Having been exposed to the horror of civil war as a child, Freedom has always dreamed of achieving the highest educational qualifications and serving his Karen community to the best of his abilities. Pan is the first high school graduate from her hometown in northern Myanmar, and the first to study abroad. She dreams of someday going back to build a school for students there. Boasting strong business acumen, Kit Kit had run two small businesses on her own before pursuing an advanced degree. She plans to use her education to grow her businesses and share her newly-attained knowledge with others. Raised by a single parent in Nepal, Smriti has seized every opportunity to pursue her education. After earning a master’s degree in biomedical engineering, she plans to work for the benefit of rural people in Nepal. Working as a midwife in Umpiem Refugee Camp inspired Shwe Sin to pursue a degree in nursing. She hopes to become a registered nurse and eventually a health resource and authority for her community. One of seven raised by her mother, May worked eight years after high school before starting college. She hopes someday to start a non-profit that provides students with the skillsets needed for employment. A competitive dancer with a passion for health, Chit Chit wants to become a successful business owner and open her own hospital. The daughter of a farmer and single father, Ae Ying's education came in fits and starts. She wants to become a teacher to inspire others like her to keep on learning and to never give up on education. A talented painter and former class president, Moe Min dreams of becoming a social studies teacher and rebuilding schools in his community. Despite taking out loans with high interest and selling a family cow, Nwe Nwe's parents were never able to pay for her degree. She is now a scholarship recipient who wants to become a community worker for Myanmar. As a politically-minded person, Saw Kyaw is engaged in the peace process and election activities in Myanmar. He dreams of establishing the first community college in his homeland, Karen State. Being raised in a community affected by drugs influenced Kham Hom’s decision to pursue a career in social work. She hopes attending university will prepare her to work effectively in meeting her community's needs. Mokawn hopes to use her master's degree in diplomacy and international studies to contribute towards genuine democracy in Myanmar. She is the first Zomia student to fully repay her loan and become a lender. Growing up in a military conflict zone in eastern Myanmar had a significant impact on Shining. Today she is the founder of a non-profit that conducts peace-building trainings with youth in her hometown. Due to scarce financial resources and educational opportunities in Myanmar, K Zin moved to Thailand to seek a better life. A migrant herself, she is now studying international development and hopes to serve migrant communities in Thailand. Growing up with an absent father, Twinkle dealt with family problems and financial hardships as a child. Today she is studying international business and dreams of becoming a successful businesswoman. Shan Shan believes with an education, energy and persistence can conquer all things. With a master's in education and curriculum, she aspires to become a great English teacher in her hometown. Until he joined the Pre-Collegiate Program in Yangon, Lynn did not have an opportunity to study the subjects that interested him most. He now hopes to establish a not-for-profit multimedia initiative in Myanmar. 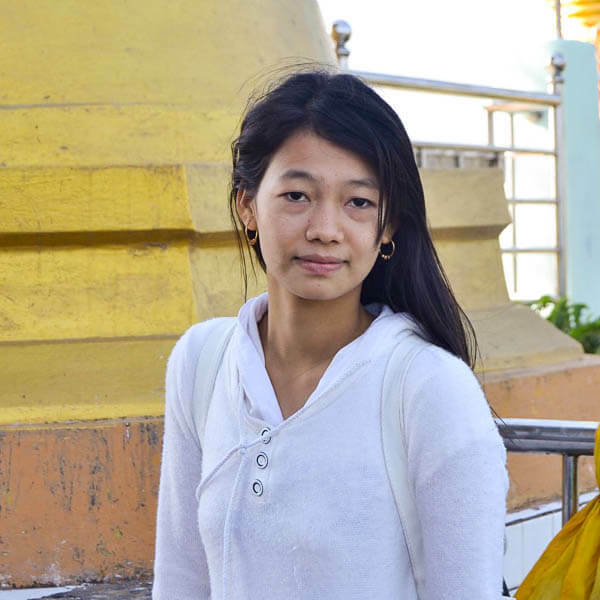 School closures in Myanmar prevented Esther for years from obtaining a degree. Today, she is a master's student at Payap University hoping to return to Burma to open an English-language training center. Smart, charismatic, and a natural leader, Jom was Zomia's first loan recipient and first full team member. He is a relentless activist who dreams of leading Myanmar's Ministry of Health. Thukha became fascinated with development after observing aid workers in the field. He hopes to use his degree to increase literacy, respect of human rights, and protect the environment. Bora is pursuing a master's in development studies to build on his technical background in architecture. Bora envisions a future Cambodia where the cities are well-planned and able to support urban growth. Day Chit grew up in an internally displaced person (IDP) camp along the Thai-Myanmar border. He can't stand war and hopes someday to work as a political peacemaker on behalf of the Karen people in Myanmar. A budding teacher studying education and psychology, Pwint looks forward to returning to her hometown to teach students who have either dropped out of school or never had the opportunity to attend. Actively involved in the Karen revolutionary movement, Sweetstone and his family have consistently endured hardships. Even after arriving in Thailand as a refugee, he has continued working to improve the lives of his people. Khat Khat continued to study despite repeated failures to secure higher education funding. Well aware of the importance of education, she is committed to developing educational services for younger generations in her community. Denied basic rights as a member of the Rohingya community in Myanmar, Zay Min Khant had little choice but to move to Thailand for a better life. His present goals include becoming a successful businessman. Bullied by others as a child, Daniel used his musical talents to make friends and overcome his shyness. Currently studying social science, he hopes to become a community leader one day. Steven couldn’t afford college so he enrolled in a free college preparatory school along the Thailand-Burma border. With a Zomia loan, he wants to pursue a degree in social science that will help him serve his community more effectively. Educational opportunities are few and far between for migrant people. Against all odds, Jim—who became a migrant at 13 years old—has been striving to achieve his educational goals and become an entrepreneur. Phu Murng is a master's student in Social Science at Chiang Mai University. He dreams of one day becoming a Member of Parliament. Unable to pay for his educational expenses, Kaung Khant was nearly forced to drop out of school. Now preparing to graduate in 2019, he is keen to lead community development programs in Myanmar. An academic achiever on partial scholarship from her university, Sitha wants to gain work experience with a company after graduation before opening a small business in her hometown. Ko Phyo hopes to contribute to Myanmar's reforms. After working years for both a company and non-profit, he believes an MBA will best prepare him to help his country during a time of transition. Sandy has confidence she was put on this earth for a purpose. She believes a Zomia loan is a ladder that will help her become one of Myanmar's most successful businesswomen. It's Patrick's entrepreneurial nature to believe in miracles. He is optimistic one will happen in Myanmar, and he expects a degree from Rangsit University will prepare him for that bright future. As a business student, Thin has come up with a number of ideas to contribute to her community in Myanmar. Among them is establishing social enterprises to create job opportunities and bring prosperity to the people. Inspired by her mom who raised her as a single parent in rural northern Myanmar, Zinghang is determined to become an entrepreneur who promotes a better working environment for women in her hometown. Since 2003, Angela has worked with the Burmese migrant community as a teacher, education coordinator, and school head. A master’s in counseling psychology will help her understand students’ needs and become a more effective teacher. Described as "loved by all" by her friends, Moon is studying business with the hopes of finding a job after graduation that can support herself, her parents, and future students like her. A refugee at five after the military razed his village to the ground, Shine is now a student at Payap University hoping to make a big difference in Myanmar someday. An academically driven student, Eaindra is always looking for challenging learning opportunities. With a keen interest in computer science, she is studying in Germany and hopes to create application platforms and A.I. programs in Myanmar. After working as a business researcher for years, Ei Ei is now studying business administration in Thailand. She hopes to establish a social enterprise and create job opportunities at the grass-roots level in Myanmar. Nilar left Myanmar to pursue a better education along the Thai-Myanmar border. She hopes to someday help young people achieve a better life and education than she had growing up. Discovering the reality that many in her community suffer from mental illness, Kameron—currently a pharmacist—recently decided to pursue a profession in counseling and psychotherapy. After gaining knowledge and work experience in social, gender and health-related fields in recent years, Su believes a degree in social science will enable her to help vulnerable women and children more effectively. Ei Lin's parents like to say that as a kid they pushed her, and as an adult she pushed herself. Today she is a scholarship recipient with an ambitious plan to run a social enterprise in her community. After her grandmother passed away from complications of treatable ailments, Mwe Leng promised herself she'd become a nurse. She aspires to help make the world a healthier place by opening a clinic in her hometown. Coming from a humble agrarian background, Naw Dah understands the needs of farmers. She hopes to become a successful businesswoman and share her knowledge and experience with farmers in her community. At just 18, Thazin became one of Zomia's youngest students to enter college. She is active in issues related to social justice and is well on her way to an early university graduation. On partial scholarships from Brackett Foundation and the Euro-Burma Office, Lin Kham wants to use her degree in social science to work on women empowerment issues and human trafficking. Having moved from a war-torn village in Nagaland to the big city of Bangkok, Lai has come a long way in pursuit of her dreams. She would like to become a business expert and aspires to serve as a political leader in Nagaland. Sue Lay landed in a refugee camp when her family faced financial challenges following her father’s death. While many in the camp fell prey to early pregnancy and drug abuse, she remained focused on her ambitions. Nanda is passionate about clean water. He hopes a degree in urban environmental management will prepare him to give competent advice to the Myanmar government on issues related to industrial zone planning and wastewater management. An enjoyment of community development studies encouraged Miki to become a social worker. After graduating, she plans to work along the Thai-Myanmar border, providing services to migrants from Myanmar. As a child, Ying worked as a migrant laborer on farms in Thailand for a dollar a day. A Zomia loan will help her reach her dream of becoming a community nurse in eastern Myanmar. The only son in his family and the first to attend college, Shawn is Zomia’s first student from Bhutan. He decided to pursue a degree in nursing because he loves helping and taking care of people in need. Raised by an alcoholic father, Ah Tar pursued his education despite personal problems. Thanks in part to sacrifices from his mother and sister, his dream of earning a university degree will soon be realized. Jan Hseng was three years old when her family fled to Thailand to escape the violence in Shan State, Myanmar. After her studies, she hopes to use her skills to make local products available in international markets.